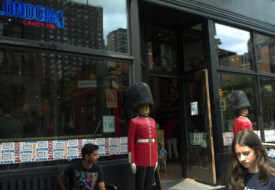 While New York City shops Dylan’s Candy Bar, Economy Candy, and The London Candy Company do carry some items you’d be hard pressed to find elsewhere, I think it’s true that buying candy at these places – and at any candy store, really – is mostly just a good excuse to visit the stores themselves. Just as you don’t really need to venture all the way to New York’s Fifth Avenue Apple Store to buy Apple products, you don’t necessarily need to go all the way to the Midtown Manhattan Dylan’s Candy Bar outpost for the candy – you can buy it online and at branches in the Hamptons, Los Angeles, Houston, and soon, Miami. But as with the flagship Apple store, truly experiencing Dylan’s NYC means gamely placing yourself shoulder to shoulder with the tourists of the world, as well as descending an impressive staircase (though, the one at Dylan’s is famously studded with candy). I've always appreciated the efficiency of Dylan’s. The street level is easily accessible via the northeast corner of 3rd Avenue and 60th Street, and, despite fiendish crowding around the store’s central candy-bin kiosk, it’s easy to scoot downstairs for the more interesting inventory (most notably the old-timey candy along the north side) or upstairs to the less-trodden ice cream shop, where my son and I successfully rolled the dice on a pancakes and syrup flavor. And, as busy as Dylan’s gets, the cashiers have always known what they’re doing, which is more than I can say for a certain coffee chain. If not for a recent personal need for several five-pound bags of sour apple Sour Patch treats, it might have been a few more years before I made it to the Lower East Side’s Economy Candy at 108 Rivington Street, and it was worth the trip just to wander the cramped space that functions more unabashedly like a stock room than a retail store. If Dylan’s is all “Look at me!” from its flashy windowed perch, Economy is more “Blink if you want to miss me, pal” with its modest blue awning and uninvitingly cluttered windows. Walk in and negotiate the shelves, though, and, amid the bulk candy, Pez dispensers, and packs of gum with witty sayings (“Please don’t make me go all CAPS LOCK on your a*s” was a keeper), you will be charmed, even as you find yourself relentlessly having to get out of somebody’s way. But that’s the Lower East Side at its most authentic, anyway – of the three stores, this is the one most worthy of a walk around the surrounding neighborhood to capture the architecture and flavor of old New York. Speaking of neighborhoods, the Lexington Avenue one that ensconces The London Candy Company is a bit sleepy, and seemingly by design the store – which opened in the spring of 2011 – fits right in amid boutiques that are as forbidding to children as the candy shop is inviting. Stroll in and you pretty much get the whole place at a glance, but, as with the area boutiques, there’s a pristine and ordered arrangement to the tables and shelves of candy heavy on the Cadbury and Haribo lines (which you can find in plenty of other New York stores, but again, that’s beside the point) and you can get ice cream and always worthy Stumptown coffee from the eager-to-please staff. The London Candy Company is quiet – on previous visits since its opening, my eldest daughter confirmed it often is – and I’d speculate it’s because people are still discovering it. For me, the quiet and lack of bustle in the neighborhood and the store itself provide a nice counterpoint, both to the other candy shops and the city itself. If you’ve wandered from the Museum Mile and are in need of a sweet fix, you could do a lot worse than a stroll past the London guard mannequins outside to get it here.